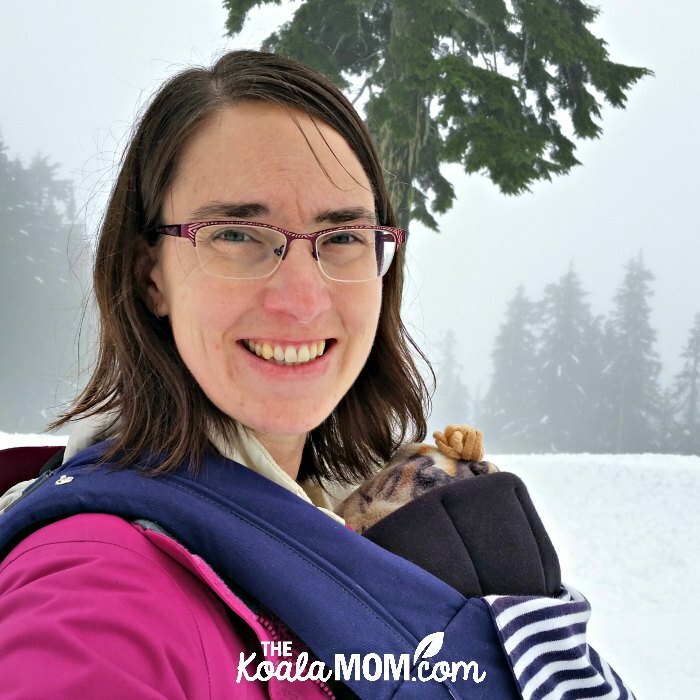 When my husband suggested getting an annual family pass at a local ski hill, he thought we’d be snowshoeing and sledding—activities that are doable with small kids. I thought about my downhill skis, sitting dusty and lonely in the back corner of our storage room for the past ten years. We have gone sledding (a few times) and snowshoeing (once), but we’ve spent most of our time up at the hill skiing. 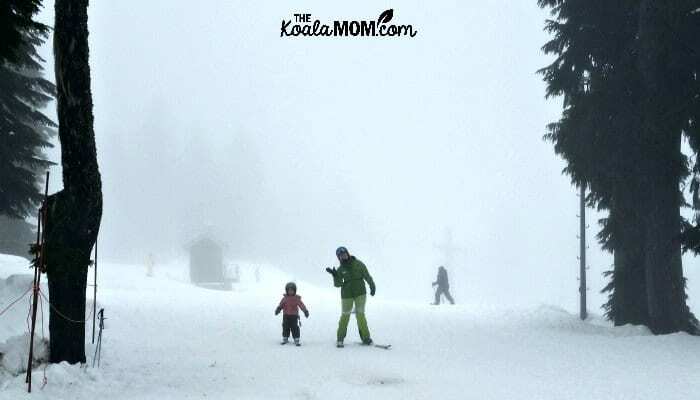 Here’s how I’ve been teaching kids to downhill ski. 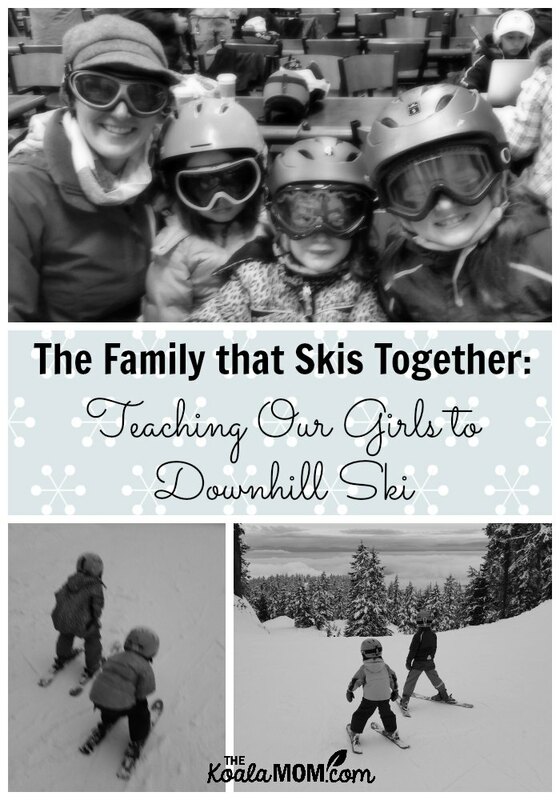 When my brother asked what the girls wanted for Christmas, I promptly answered, “Ski lessons.” I’ve learned that knowing how to do something and teaching someone else how to do it are very different things. I taught myself to ski, but I knew I couldn’t teach the girls. 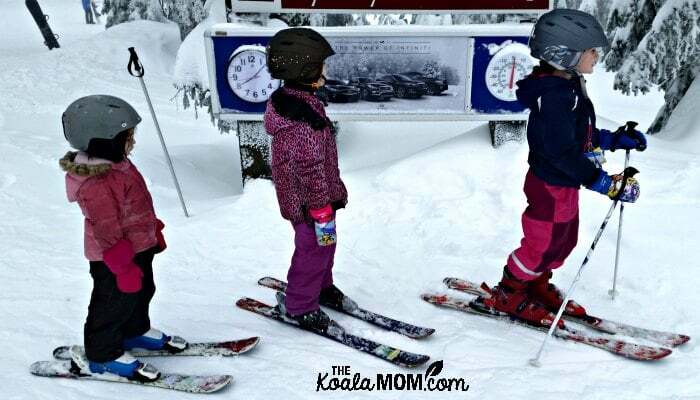 My only question was when to get them into ski lessons, with a baby coming in early December. I waited until early January to book the girls’ lessons. If you are planning to ski with your children, I recommend booking lessons as soon as possible. 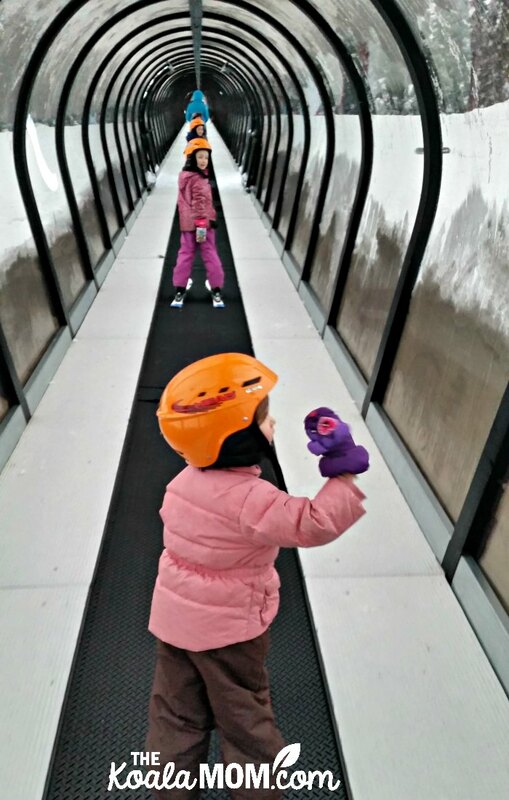 Most of the lessons at our local ski hill, especially for preschoolers, had filled up quickly. This left us with limited options for the girls’ lessons. Sunshine and Lily (ages 9 and 7) did their lessons in mid-January. We got a discount on their lessons because we had our passes. My husband took them up and practiced skiing a bit while they were in their lessons. Then he took them to play on the bunny hill. Apparently everyone in Vancouver puts their preschoolers in ski lessons, because there were no lessons available for Jade. I called several times to ask, but preschool lessons were always full. While I waited, I began to wonder if Jade was even ready for downhill skiing. Because her big sisters were doing it, she wanted to try. However, when we went sledding, she refused to ride down the hill without Mommy or Daddy. If she couldn’t slide down the hill on her bum, how would she do standing up on skis? I had also just tried to start her on violin lessons, but she’d quit ten minutes into each lesson because it was too hard. I didn’t want to spend money on a ski lesson for her, only to have her spend most of it sitting at the top of the hill because she’d fallen down or decided she couldn’t do it. Finally, I took her skiing myself to see how she liked it. My husband sat in the lodge with Pearl (playing on our tablet) and Joey (napping in his car seat) while I got rental gear for the older three girls. We headed to the little learning hill, where I asked Sunshine and Lily to show Jade what they’d learned in their lessons. They demonstrated “pizza” and “duck walk” for her. After sliding down the hill twice and hiking up once, I decided that hill was too small. We trekked across to the bunny hill, with me pulling Jade along most of the way. There, I watched Sunshine and Lily head down the hill. Then I took Jade’s hand and we began to slide. In a clumsy, zigzag fashion, we made it down the bunny hill, with me holding her up the entire way down. It was fun. She wanted to do it again. We rode the magic carpet up the hill, as I texted my husband to see how the younger kids were doing. Fine, he said. Keep skiing. So we went down again. And again. By the fourth or fifth time down the hill, Jade was willing to let go of my hand and ski a bit on her own. Even when she had a couple falls, I managed to keep her positive and get her back onto her skis. Her first day on the hill was a big success! I took her skiing myself again one more time before finally booking a tot private lesson for her. I was able to tell her instructor what I’d already done with her. While we’d been skiing the bunny hill, I had watched the other instructors with their students. I knew Jade needed a lesson to learn some skills I couldn’t teach her. After her lesson, Jade came back grinning and happy. Her instructor had rave reviews about her skiing. They’d gone down the bunny hill several times, and then her instructor took her all the way down a green hill and up the chair lift! Jade was very pleased about that, because Sunshine and Lily hadn’t yet ridden the chair lift. Her instructor said she was probably ready for the advanced preschool ski club. With Jade able to get herself down the hill, it was time to learn how to get the girls up the hill. We spent an afternoon practicing the chair lift. First, I left the older girls in the lodge with my husband and took just Jade out. We went down the hill once, then she explained how her instructor had taken her up the chair. Knowing I could get her on and off the chair, I left her at the lodge and took Lily out. The first time we went up the chair lift, I helped her get on and off. However, she needed to be able to do that by herself so that I could help Jade. So we went down and up again. 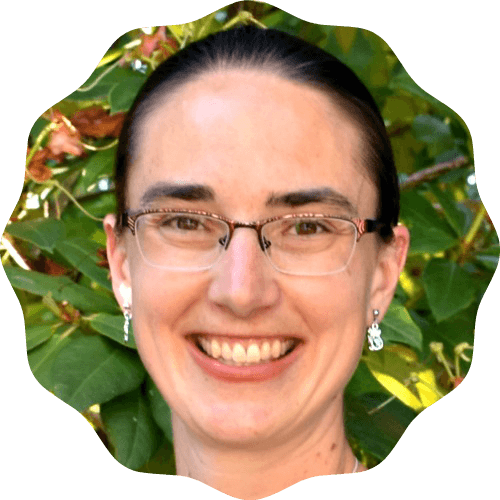 This time, I helped less and coached more. Then we went down one more time, and I didn’t help her at all. Confident that she could ride the chair by herself, I dropped her off at the lodge and repeated the three lessons with Sunshine. Finally, we were all ready to hit the ski hills! 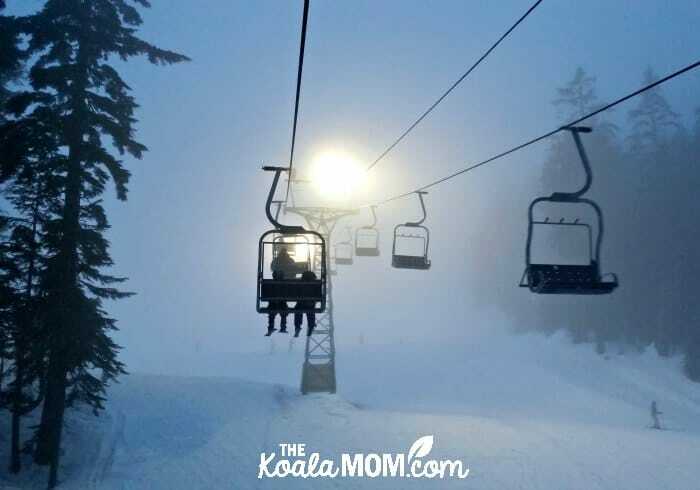 I had three kids who could ski down a green run and ride a chair lift back up the top again. It was an exciting day. While we were up there for Jade’s ski lesson on a Friday afternoon, we ran into a friend of ours. He’s a teacher at a local school and was there to take his students snowshoeing. 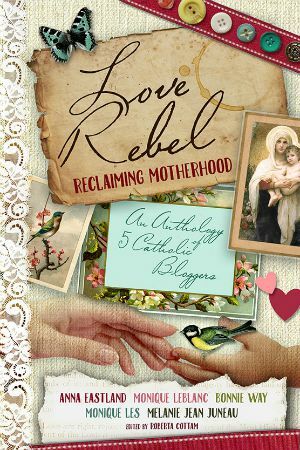 As a homeschool mom, I had all five kids with me; I was carrying Joey in his car seat (to keep him warm and sleeping), telling two-year-old Pearl to stay close to me, and marching all the kids around the lodge to meet the ski instructor. Yes, I hauled five kids up to the ski hill by myself so one of them could have a lesson. I stood around in the snow with a baby on me (after he woke up and I switched him to the Juno), watching three kids play, anticipating being able to ski again. Because it’s not just about them. For ten years, I’ve given up activities like skiing that are hard to do with small kids. This year has felt like the payoff. Now the girls are old enough to do it with me, and I get to do something I love again. It’s worth the work of teaching kids to downhill ski. Before Jade’s ski lesson, we invested in used ski equipment for all the girls. Since then, we’ve been skiing every weekend (or more often). Having the passes and our own equipment means we can drive up to the hill, get into gear, and start skiing right away. When the girls get cold or tired, we load up the van and head home again. Skiing together has been a lot of fun. I’ve been surprised at how fast the girls have mastered this sport. I’ve also learned more about them. Usually, Lily is more cautious than Sunshine (she took longer to learn to ride a bike than her big sister). On skis, Lily has been flying straight down the hills while Sunshine carefully cuts back and forth. I wasn’t sure Jade was ready to start skiing, but she’s often been the last kid skiing (and I’m trying to talk her into quitting because I’m cold!). 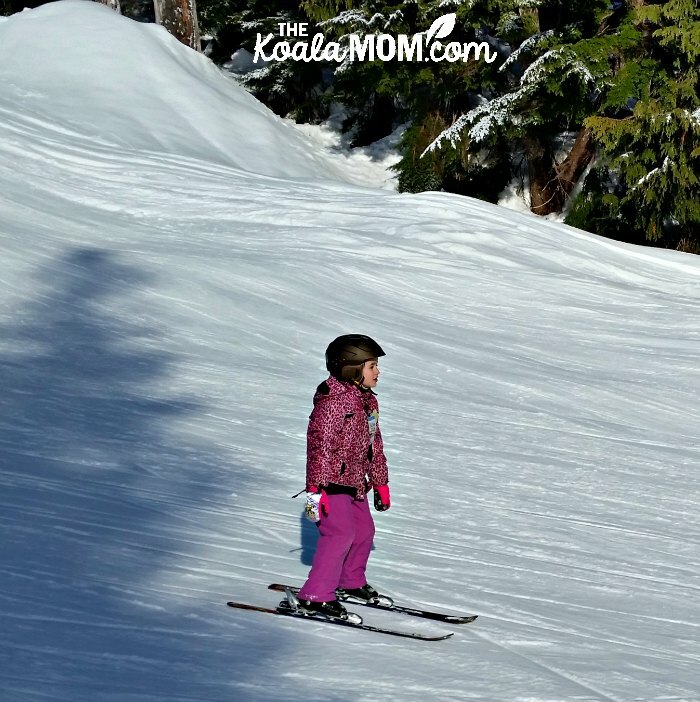 Have you taken your kids skiing? 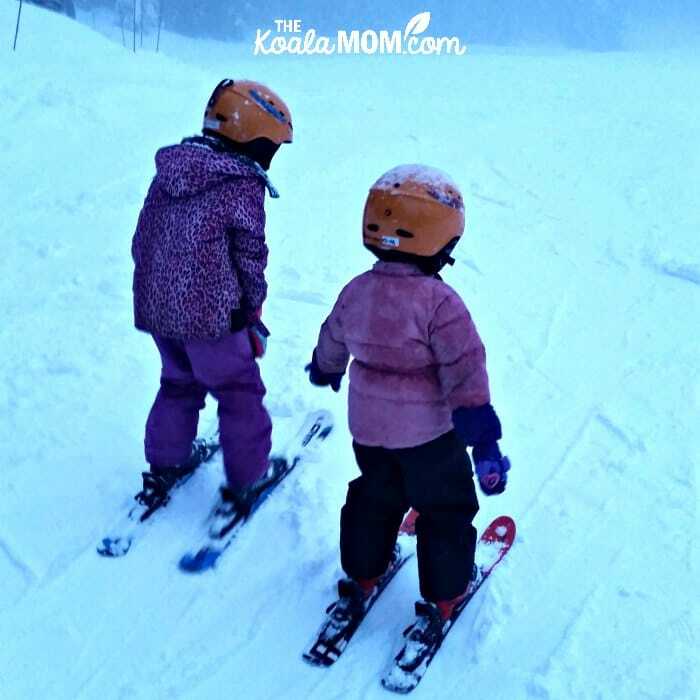 What has helped you in teaching kids to downhill ski? Great job, Bonnie! What a sweet family activity!